Working closely with LP Systems, Lawo specialists configured, tested and delivered the systems for the World Games 2017 Multi-venue event. To support Polish broadcasters covering the World Games 2017, held in Wroclaw, Poland, system integrator LP Systems relied on Lawo IP technology and systems. The annual sporting event saw 3,500 athletes competing from 112 countries in events not included in the Olympic games. With a massive global audience spanning 131 countries, Polish company ATM System was responsible for providing broadcast resources at the IBC (International Broadcast Center) and all remote event locations. LP Systems was appointed as main contractor for the remote production setup and used remote racks with Lawo technology installed at the various venues to aggregate the numerous video and audio feeds and route them to the IBC where they were forwarded via SDI to the central router on site. Using a new IP-based remote production workflow, ATM System successfully produced and broadcast 429 hours of live coverage from all of the World Games venues on behalf of the International World Games Association (IWGA). LP Systems used remote racks with Lawo technology installed at the various venues to aggregate the numerous video and audio feeds and route them to the IBC. The technical solution involved Lawo V__remote4 units, A__mic8 units, Arista7150S-24 switches, and a dual-server Virtual Studio Manager (VSM) System for overall control. 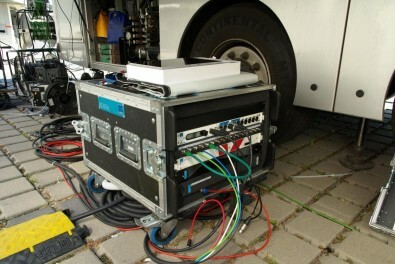 A total of nine Remote Racks were used to serve 13 venues, linked to a local OB Van. These included two that were equipped with a pair each of V__remote4s and A__mic8s, two racks loaded with two V__remote4 and an A__mic8, and five racks with V__remote4 and A__mic8 units. Working closely with LP Systems, which supplied the Lawo equipment and handled onsite testing and logistics, Lawo specialists configured, tested and delivered the systems that were then supported by staff from LP Systems and all other participating companies during the setup and event days. A company called 4Vision provided the Lawo VSM System. More recently, Polish Television produced live programming from the Winter Olympics in Pyeongchang, South Korea using Lawo V__pro8 video processors for the IBC studio infrastructure. This allowed the operators there to take advantage of Lawo’s flexible routing and monitoring platform. All of these products will be on display at the 2018 NAB Show.